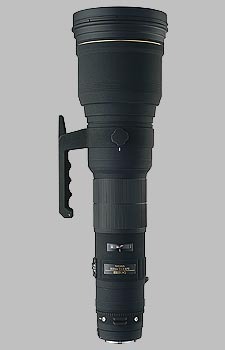 (From Sigma lens literature) Sigma's APO 800mm f/5.6 EX DG is one of the EX Series lenses. It is an Apochromatic ultra-telephoto lens with a fast f/5.6 maximum aperture, and incorporates two Extraordinary Low Dispersion glass elements (Abbe number 90.3), to reduce chromatic aberration to minimum limit. It also incorporates internal focusing which enables responsive and fast auto focus speed. The AF drive for Sigma SA, Canon and Nikon SLR cameras features the ultra-quiet Hyper Sonic Motor (H.S.M.). This lens also incorporates a rotary filter holder in the rear part of the lens barrel, which enables the use of a polarizing filter. Sigma's dedicated APO EX Tele Converter 1.4x MF and 2x MF can be used with this lens. The lens materials used in this new lens are lead and arsenic free ecological glass. The Sigma 800mm f/5.6 EX DG HSM APO doesn't have any user reviews yet!